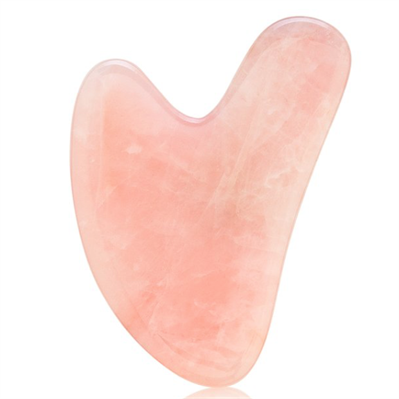 Gua Sha (the eastern botox) is a treatment/therapy technique that involves pulling rose quartz stone along the skin, and as this is done the skin layers are stimulated to reduce puffiness, promote anti-aging, flush out tissues via lymphatic drainage and much more. Unlike the traditional gua sha, when the facial is done properly using a light hand technique with facial oil should leave no marks on the skin. Having stood the test of time, and being passed down for centuries from ancient Chinese Empresses to the modern day goddess it is a holistic treatment many lean on to clarify their complexion, decrease dryness and acne and oiliness by increasing blood circulation. Gua sha can help address the root of aging that topical products cannot; it increases circulation, decreases muscle tension, and helps move the lymphatic fluid while giving an almost immediate lift and radiant glow. The ergonomic design was hand carved to adapt to the shape and contours of the face used to perform a relaxing decongesting facial massage. This little unique tool is for professional or at home use and is an excellent addition to any routine to help making facial features appear more youthful and well rested.